Artix Entertainment, a small indie studio comprised of 5 individuals, has announced the beta start date of their latest PvP MMORPG Oversoul. The MMORPG will be available for everyone to try tomorrow, October 31st. Oversoul is an interesting browser based MMORPG that focuses heavily on PvP fights. Traditionally when we see a turn-based MMO it generally relies heavily on its PvE encounters. In the case of Oversoul though, we see an interesting system in place of the more traditional turn-based titles we have seen. Players are given battlecards to battle against each other. Each player and monster has its own strengths and weaknesses and so players will have to adapt which cards they use to each situation. There is some PvE in the game but it mostly serves as a way for players to gain more cards to use in PvP battles. Once a player defeats a monster, the player will have a chance to possess the monster and play the game as that monster. Monsters can then be evolved over time, increasing their stats and actually changing their appearance. The game seems to have quite a bit of depth with each player managing 5 cards throughout the battle. Each card has its own focus, whether that be attack, defense, or a special move. Specials are fairly rare and allow for unique abilities such as preventing an enemies turn completely or exchanging hit points for a greater attack. However a player cannot always cast a card. Each card has a energy requirement in order to cast and players must decide if they want to expend energy casting just one card or wait and “charge” their deck for more energy to expend the next turn. It becomes an interesting risk/reward style of play with players risking a brutal enemy attack in exchange for enough energy to cast a couple of cards in one turn for perhaps a game changing blow. It’s interesting to see card game style of mechanics heavily implemented in an MMO which on the surface seems to try and distance itself from a traditional Online TCG. I’ve been getting more and more into turn-based games lately and will have to give this one a whirl as well. You can sign up for the beta yourself over at the official website now. Are you fans of turn-based MMO’s that have card like mechanics? I felt I should make an update on my review I did 3 months ago since I logged on this game today. It’s sad how this game died this game had alot of potential but I found out this game was rushed to launch day which was most likely why it failed. No one really plays oversoul much now since the person who created it left the company I’m not really sure why I heard he was fired,laid off or he quit but I’m not really sure I just heard a bunch of different reasons I don’t know the exact reason but I do know the creator of oversoul don’t work for artix entertainment anymore. But personally I felt if the CEO didn’t have this game rushed to release day this game would be popular. But all I gotta say for this game now is it’s not worth investing money or time into it since the playerbase is very much dead. It’s not 100% dead since a few players log on but not many do but they haven’t updated this game in over a year. It’s clear AE has given up on oversoul so my advice for anyone who reads this review is not to invest money into this game unless they ramp up production for this game again and get more staff and get this game alive again. In my opinion they would be better off shutting it down and rebuilding it since they rushed it to release they haven’t even gotten it out of beta and it got released back in 2012 pretty sure it should of been live by now. 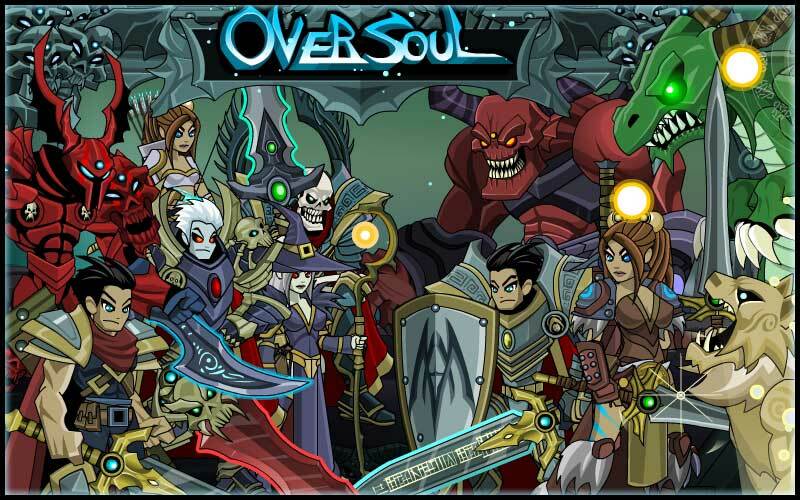 But yeah if your smart you wouldn’t invest money in a dead game it’s all I wanted to say about oversoul but I do admit it has alot of potential even I would play it if it was up to par and had a decent playerbase and alot of new content. Kinda don’t wanna review this game but I feel like since all the other reviews are from 2012 I’d update it with a current review. I feel this game would of been better off as a mobile game but the other commenters are right the community fanbase for this game is kinda small see the same players and the fanbase on this game got smaller since 2012 so this game isn’t really fun to play since no one really updates it anymore but the game would be fun if it had the staff members and was built for mobile devices. This game seemed rushed to release it was even announced by AE this game was released before it even was ready which why it failed. I really hate to sell out AE like this but I feel like the people reading these reviews gotta know the truth. I’m the same Unknown guy just giving a update on my comment sorry for my spelling in my first post above I didn’t proof read it. But this game is really fun searching for characters and pvping people and going in a dungeon. But the sad part about this game is that it died rarley any staff work on this game as far as I know, The project lead for oversoul even left artix entertainment but he helps out artix entertainment when ever they request him for help on a certain project from what I’ve been told I have no idea what projects though but currently he doesn’t work with the company. But this game has been stuck in beta since 2012 it never left beta they even skipped 3rd upholder because they didn’t even have enough staff members to work on oversoul to release the content. Like I said above I really feel bad for selling out AE by posting these reviews but I feel the small AE fanbase isn’t gonna go in full about the game since they care about the company they obviously will say it’s the best game ever. Played 2 weeks, couldn’t get into it. Gave up account. I tend to see a lot of the same players. sign of a small community. I’ll stick with Fb games as well. This game isn’t for everyone. Only die hard AE fans. Which looking at the players online, isn’t many. Same it’s why I gave up my account. I couldn’t really get into it either and the community has gotten even smaller since the guy who created the game quit the company. So signs that this game is in bad shape right now. I feel like the game would get alot better if they rebuilt it as a mobile card game but I don’t see it happening since they don’t got money or staff and since this game isn’t even in full launch and since the guy who made the game left the company like you said. But I do see full potential in this game but Artix entertainment just isn’t pulling it out sadly. I did play this game for a time also but I gave up on my account since like you said the community is so small and since the guy who made the game quit they don’t got updates for oversoul and haven’t updated it since 2015 so it’s way boring on here and it’s not worth playing and no offense to anyone to what I’m about to say but if you still buy micro currency for this game then your not very smart since the communities dead,no updates,the games lead quit the games just dead and in bad shape. They would be better off scrapping the entire game at this point and rebuilding it as a new product I don’t see much point saving it since it’s been in beta for 4 years now and still in beta. I felt like this game could of done great on mobile better then browser. This game is very promising. I have been playing it for a while now (throughout stress testing and Alpha stages) and it is extremely fun. At the moment, there isn’t much to do, but that is bound to change as the game is further developed. The main objective is to capture souls. You go out and battle creatures (characters) in the hopes of possessing them. If you successfully possess a character, you can use it in battle (think Pokemon). Each character is aligned, both morally and element-wise. Each character comes with a predefined set of cards to use in battle. You have control of 5 cards at a time. Cards can be used to attack, defend, heal, and more. Each card has a certain amount of energy that is required to use it. You can gain energy by charging (which consumes your turn). You also get smaller amounts of energy by using cards or drawing cards. Winning battles (whether through PvP or PvE) grants your character experience. After a certain amount of xp, your character levels up. Each character levels up independently, and after reaching certain levels (it seems levels 4 and 10 are the lucky numbers so far) you will be given the option of evolving your character up a rank. For example, you take a novice character and level it up to level 4. You can evolve it and it is then a veteran character. Your level resets, and once you reach level 10 with your veteran character, you can evolve again into a master character. There are many more ranks to be involved, and even the choice to evolve your character down a specific alignment path (good, evil, and neutral). Your character would change its attacks and appearance depending on the path you take. Some of you are worried about this game being pay to win. Just thought I would mention that unlike AE’s other games, the devs have stated that it is very likely that there will be no upgrading your account in this game (like how there is a membership in AQWorlds, a Dragon Amulet in DragonFable, a Guardianship in AdventureQuest, etc.). There will only be the secondary currency (SoulGems in this case) which is used to buy premium items. Just like every other MMO. Also, another note of significance. Artix Entertainment is known for making games that are family friendly (appealing to children and older players alike), as many of you are aware. This will be there first game that is targeted toward a more mature audience. Just something to think about. Tell magicman he owes me pancakes!!! I skip breakfast every morning hoping to log on first thing and find a new and amazing MMORPG coming out and every day I am disappointed! Well it is time to pay up magicman, if there is not a good F2P out in the next two weeks you better come to my house and server me pancakes or else I will email you pictures of pancakes until you do it.